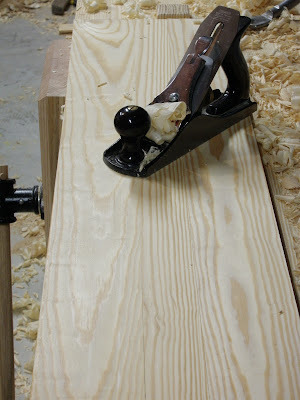 I didn't have any stock wide or thick enough for the sliding deadman, but I had plenty of waste left over from the top. 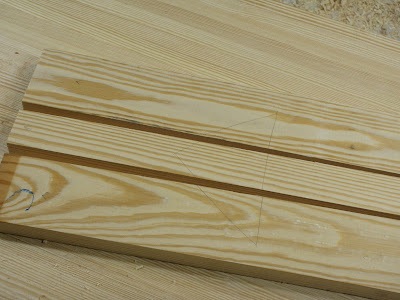 I glued up two panels for proper width, to be laminated for proper thickness. Sections for the first panel. 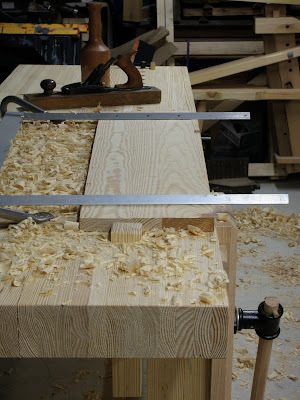 I ripped a narrower central piece so the solid widths of the other panel would overlap these, and jointed up the matching edges identified by the cabinetmaker's triangle. The two panels glued up. 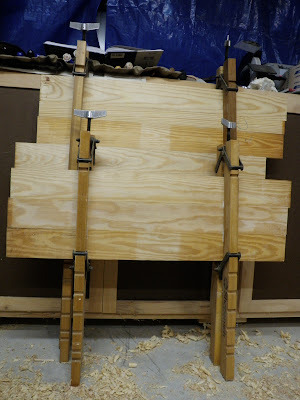 The one in back is the same overall width, but I had to add extra spacers because the clamps wouldn't adjust that small. 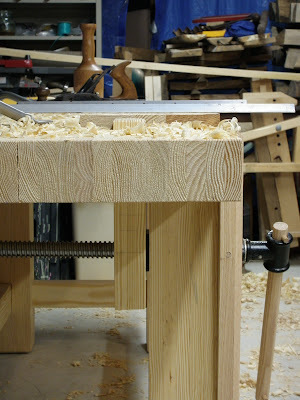 I should modify these clamp rails to handle narrower widths. This time, I did a thorough job of wiping off the excess glue with a sponge and bucket. That made cleanup a lot easier later once the glue had dried. There were no big gobs to damage my plane iron. 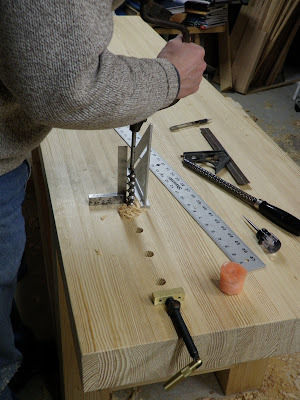 With the panels clamped up, I started drilling the dog and holdfast holes. All 25 of them. I spaced the dog holes 3" apart, accommodating the travel in the Wonder Dog at the end. I used the cylindrical surform rasp to clean them out a bit. 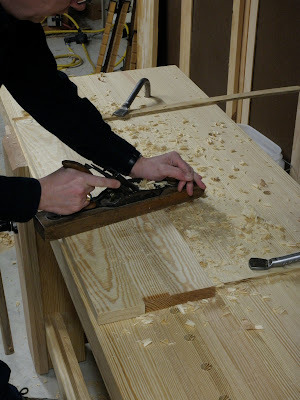 All these holes got to be a lot of work, so after each one I spent a few minutes sweeping up shavings to rest my arms. Finishing the holes off from below, having just pierced the bottom side when boring from the top. I had to take off my bifocals to look upwards this close! 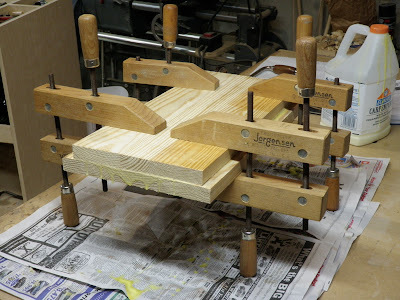 After completing the holes, I removed the panels from the clamps. They'd had about an hour of setup time, so the glue joints were strong enough. Then, before it completely hardened, I lightly cleaned the last bits of glue off the panels and clamps with my glue clean-up chisel. This glue drip management was a lot easier than chiseling off rock-hard bits a day later. I let the panels finish curing overnight. First use of the new Gramercy holdfasts! I rough-planed one side of each panel, traversing almost straight across after first chamfering the edges. A note about the Gramercy holdfasts. I had just gotten them recently, and I initially had some trouble getting them to grip well. They kept coming loose under the force of planing. 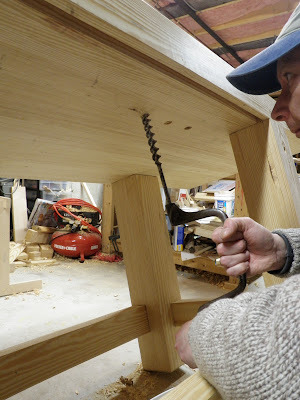 A little checking online revealed some concerns about holding in such a thick top, but I followed Joel Moskowitz's instructions to rub around the shank with 120-grit sandpaper. I also noticed they still had a little oil on them from the manufacturing process, so I first wiped them down thoroughly. Cleaned and roughened, they now grip tenaciously. Winding sticks (aluminum angle iron) laid out to check for wind before starting the finer work. Sighting down the length of the panel across the winding sticks. Looks good, no twist. 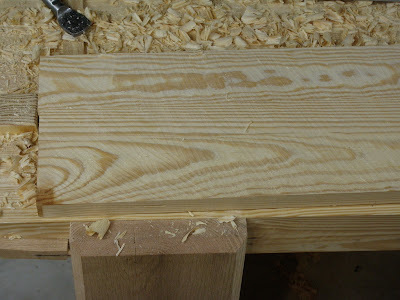 The final result after flattening with a try plane followed by this smoother. The two panels laminated together. The matching faces have to be dead flat to each other. I didn't bother cleaning up this glue, since I was going to be sawing off the waste from each side.